Maine home prices remain strong, but the number of sales fell slightly in February. 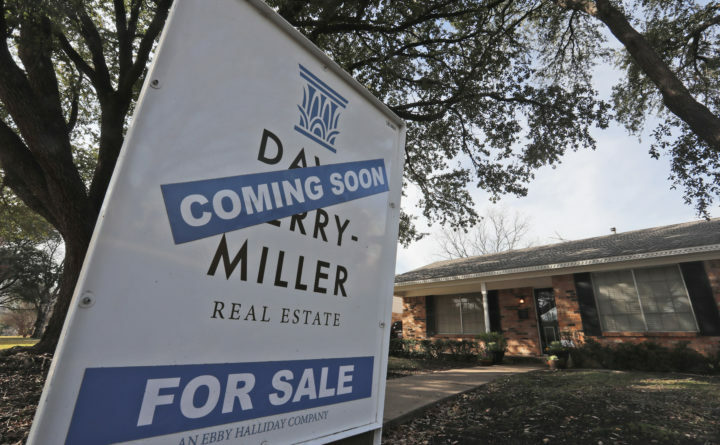 This Feb. 20, 2019, photo shows a for sale sign in front of a home near Dallas. Sales of existing single-family homes in Maine eased slightly, although prices remained strong, rising 2.85 percent comparing February 2019 to February 2018. Unit sales were down 0.49 percent, according to data released by the Maine Association of Realtors on Friday. The median sales price for the 818 homes sold statewide reached $200,000. That price indicates that half of the homes sold for more and half sold for less. Harrington said the sales volume over the past few months has decreased compared to figures from a year ago. Despite the slip, for-sale inventory continues to be tight and is 4 percent lower than in February 2018. Even with the slight decrease, the February 2019 data was the third highest February sales volume since 2011. By county, Somerset saw the largest gain in unit sales from December 2018 through February 2019 compared to the same three months a year ago. Sales rose 21.69 percent, although the median sales price was down 7.32 percent. Aroostook saw the biggest percentage decline in the three months of 22.31 percent. The median sales price also was down 9.39 percent. Sagadahoc saw the biggest percentage rise in median sales price of 15.10 percent. Unit sales were up 2.27 percent. Franklin county had the largest decrease in the median sales price, down 12.24 percent. The number of units sold was down by 16.47 percent. Cumberland saw unit sales fall by 14.21 percent and the median sales price nudge up a modest 0.61 percent. Unit sales in Penobscot were down 4.61 percent, and the median sales price also was down by 0.37 percent. Nationwide, sales were down 1.4 percent and the median sales price was up 3.6 percent to $251,400 over the previous February, according to the National Association of Realtors. Sales in the northeast increased 1.5 percent and the median sales price rose 3.8 percent to $272,900. “Traditionally, now is the time when we see a boost in the listing inventory numbers and a steady uptick in sales statewide for the second and third quarters. Mortgage interest rates are drifting lower, which will also be helpful for home sales,” Harrington said.